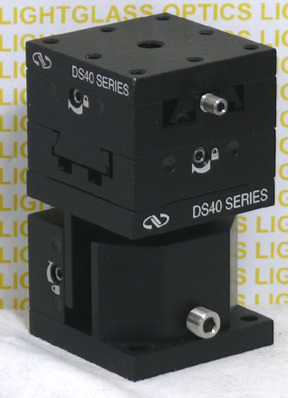 This Newport DS40-XYZ Compact Dovetail Linear Stage offers the user a "set and forget" experience. Since the positioning of the X,Y and Z axes are adjusted with a hex wrench, the "twiddlers" in your lab will have to work to mess up your settings! These also offer you better vibration resistance than a ball-bearing stage. The faces on these stages are 40mm square, with several tapped holes for mounting your items on. Travel is 0.55" in the X and Y, while the Z axis is 0.20".